As someone who takes a great deal of time in deciding on something to watch, read, or even write, I have to admit something like Mekakucity Actors felt off to me. The 2014 anime series was prodded at with a very large stick by all of my friends, warning me that it was a very polarizing experience (I would later discover after becoming a writer on here that many others feel the same sentiments). Curiosity got the better of me during a pretty cold night after work back in the winter, and I gave the show a shot. Needless to say, I was pretty confused as to all of the things happening and the feverish pace that the narrative took. Unless beckoned by another with a convincing stance to hold off dropping something, I usually discard the like within a day or two of attempting to watch it. The biggest supporter of the show, my buddy Josepe, couldn’t muster up much more than “It really isn’t that great, but I liked it.” and I found it to be right on the brink. A coworker and I started discussing anime over breakfast in the middle of that week, and I brought the Shaft series up. He, much like my other sources, hated it. The biggest consolation he could give it, however, was the opening theme song and how infectious it was to him for a couple of weeks after he managed to down the series. Probably because I had nothing better to do at the time, I investigated further. I messaged the lone fan about the opening, inquiring about perhaps the popularity the show might have taken in from it (I was, and still am, pretty out of sync with what is/was popular with openings and endings thanks to my inexperience following series by the season). The song, titled “daze”, was really catchy to me, but I didn’t bother to look into the lyrics or even give it a listen outside of the first episodes I had tried to watch. Little would I know, I was discovering a lot more than I bargained for in asking about one song. “Hey, someone who I work with said he hated Mekakucity Actors but loved the opening song. Is it a big deal?” I asked my trusty anime source. “That’s an understatement. The song was huge, and the entire reason the series got an anime really.” Josepe replied back a few moments later. “Wait, the song was what led to the anime? Did someone make a song about the manga or something?” I was as confused as always when it came to the behind the scenes of anime. “Sort of, but you have it backwards. There was a manga based off of the song.” My web-pal quickly shot back. The concept of a song originating a manga and furthermore an anime was mind shattering to me. “How did one song inspire so much?” I stumbled along. “The whole series is based off of a bunch of songs, actually.” Josepe said, essentially handing me the golden ticket to the world of mixed media projects. Trying to understand exactly where everything came to be with the origins of Mekakucity Actors confused me right from the start, with trying to understand what it meant to be a “song created in Vocaloid”. Sure it sounds silly of me in hindsight, but I had no idea that Vocaloid was the source for the singing sensation Hatsune Miku (another world I’m far too detached from- I almost had to Google the name before it clicked at the last moment). All of the music was written by one man by the name of Jin, whose vision would shape scattered ideas into an enigmatic discography. As it would turn out, these songs (notably Kagerou Daze- which gave the series a title) dominated media sharing websites with their construction from the impressive software. Within each song told a different story filled with characters facing mystery and conflict with powers outside of the realm of normality. One could sing of a girl whose abilities made her the center of attention while another might recount a never-ending nightmare of loss in stark contrast. As more came out, the stories in the songs started to be revealed as an entire story (albeit a discombobulated one) that operated at a very peculiar pace in narrative. The music on its own felt pretty intriguing, offering a very open ended approach to what a listener might think up as a story or build characteristics on the various people in the songs. Even when compared to other modern music, it is rather rare to find an album that tells a tale or a story being pieced together. The most recent example to come to mind is something like the 2012 hip-hop/rap album Good Kid, M.A.A.D. City by Kendrick Lamar, using its’ lyrics to build story in place of individual songs with no real direction in mind. The important difference between a rare album like Lamar’s and something found in the likes of Kagerou Project is what followed the musical tales. There was no expensive movie directed by the likes of Ryan Coogler or sequel album to the rap hit, leaving it as a successful static experiment. Jin’s work, however, began a stage of growth that is truly the real appeal of the Vocaloid songs. A light novel series began publishing, long winding the adventures of the Mekakushi Dan in a very different, more revealing way than the music had sprinkled throughout. Striking while the iron was hot, an entirely different project began for manga to be created for Kagerou Project . 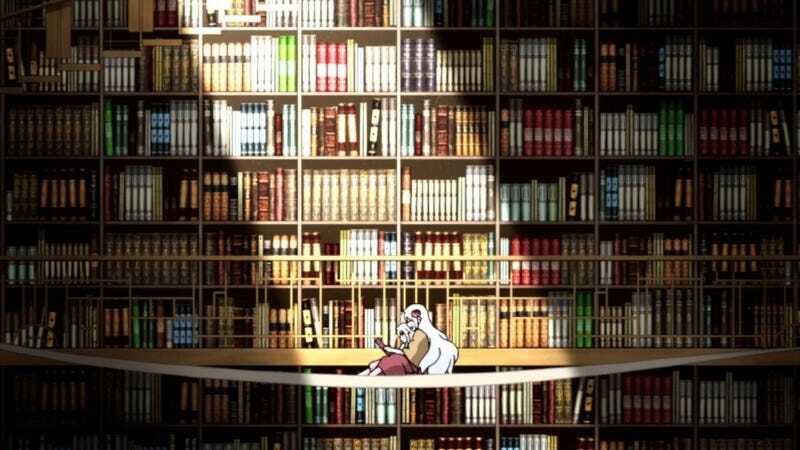 At this point, the manga, light novels, and music all varied immensely, leaving many torn on what they found the correct story and renditions of the characters to be. An absolute curveball raced across the plate in SHAFT Studios joining the party with their fittingly unique vision for what was meant to be made of the wild lyrics. This title would debatably be the biggest firestorm and potentially the only Kagerou Project work to be known of, Mekakucity Actors. Viewers scratched their heads, questioning if there was an arthouse-esque vibe they were supposed to feel or if there really wasn’t much to wherever the idea crawled out from. This confusion takes us back to where I was at the beginning of my wide journey through formats unknown, scoffing over a few episodes of neck-turning stories. With the entirety of Kagerou in mind, swallowing the rest of the bitter tasting anime series was much easier with the simple fact that the anime was constructed from what started as an interpretation of the songs. The popularity of the series feasted on all of the debate, and the creation stood as an entirely different beast for each and every person experiencing it. Herein radiates the best part of Kagerou Project and its’ various platforms: everything starts from how an adaptation of the original content, the music, and builds from there. I might be moved to tears by a song that someone else hates, or a particular piece will feel essential for another who doesn’t share the same opinions as most. Why is this? Compared to a lot of different entertainment, my theory is that this is because there is a love for mixed media (for the sake of this argument, we’ll call it a combination of music, light novels, manga, and anime) that cannot be replicated in anyone else each time someone experiences it. Expressions like “One man’s trash is another man’s treasure” radiate, and what someone can cling to and rely on to get through a hard time might be repulsing to another- that’s just how entertainment works. With mixed media, however, there is a colorful display (be it audibly, in words, art, or even a combination of the three) all carefully crafted by the interpretation of various people. The folks at SHAFT might see things vastly different than the multiple paths articulated in multiple manga entries, leaving a multitude of different places to pick up a series like Kagerou from. Such versatility isn’t only superb entertainment, it is the very essence of creativity. How many authors must there be that never realized their favorite novels started as poems? Musicians who couldn’t find the same feeling a band had the night they came up with a revolutionary song? Sure, Mekakucity Actors wasn’t that great to me (or a lot of people), but is that even the point with an adaptation of something so expansive? There has been so much in remixes, fan art, and interpretive writing over the series it is dizzying. It is nothing short of beautiful that something as tiny as a song, a lyric, a feeling can ignite creativity and a following like this. Maybe Kagerou Project is universally trash to 99.99% of Earth, but the heavy themes in it moves someone in the 00.01% to tears one night enough that they pick up their tablet and create something unique online. They network with fans of their work and those fans start using their creative outlets, until the entire cycle runs through in bold colors transcending entertainment. You can replace that series with any other that might inspire greatness. It is the very light in creativity that gives hope, and that hope is watered by inspiration in content like this. I’ve met a lot of people being online in probably more time than I should be spending of this short life, but nothing moves me quite like the impact things like mixed media have on everybody. I’ve started evenings texting someone about the music of Clannad on crowded buses and somehow ended them sitting on the floor next to my bed talking to the very same person about how they can overcome physical abuse and fulfill dreams. A simple Skype call over Toradora! ended up being the call that saved a life. I’m not saying that fairytale situations are going to come up every time, but we have such a beautiful instrument for escape, inspiration, and networking. Writing is my passion, and getting to meet and be a part of so many bright writers, readers, and genuine people’s lives will always be the best reward for doing this. Please...take a deep breath if you’re troubled, find your solace in something safe, keep your head high, and keep shining the brilliant colors of creativity I know you all have in you.